1616 Traders from Europe bring yellow fever to Wampanoag territory. The geographical area affected was all of the 69 tribes of the Wampanoag Nation from present day Provincetown, MA to Narragansett Bay; the boundary of the Wampanoag and Narragansett Nations. Fully two thirds of the entire Wampanoag Nation (estimated at 45,000) die. This also represents a loss of as many speakers of the language. Hardest hit are Elders and small children; critical age groups for any language. European disease would also place in jeopardy each tribes ability to sustain a population for defense of its territory and culture. 1620 Mayflower arrives in current day Provincetown, MA and then moves across Cape Cod Bay to Pahtuksut (current day Plimouth MA). The Pahtuksut Wampanoag do not approach the Europeans for another three months for fear of more disease being brought ashore. 1632 Missionaries begin to arrive in Wampanoag territory. John Eliot arrives from Cambridge, England and begins to learn the language of the Wampanoag in an effort to translate religious materials into Wopanaotaok (Wampanoag language) for the conversion of Wampanoag to Christianity. This is the first Amer-Indian language to employ an alphabetic writing system in the codification of its language. 1655 John Eliot translates the King James version of the Old Testament and reports in his diary that there are too many problems with his translations. Eliot then works with two of the Wampanoag students of the newly formed Indian College, Iacoomes and Cheehsahtyamuk, in order to translate the Holy Bible. This would accomplish two tasks at the same time; translation of the religious materials necessary for conversion to Christianity and have the added bonus of good PR for the purpose of gaining more funding from England via the Indian college. 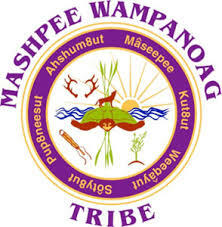 1660 Mashpee is designated as a ‘Praying Town’ and becomes the tribal village with the largest population of remaining Wampanoag left of the original 69 villages. Native written documents show that Wampanoag who had previously gone to Massachusett (current day Boston) to reside in a praying town complain that they are returning to Cape Cod due to illnesses in Boston. 1663 First copy of King James version of the Holy Bible (both old and new testaments) printed in Cambridge MA in Wampanoag. The Wampanoag would eventually go on to record, in their own language, everything from deeds to wills to contracts and letters containing the conditions under which they lived as well as personal letters. Hundreds of such documents survive today. The Wampanoag would later use these same documents to reclaim their language. 1675 King Philip’s War begins. While citizens of tribes from the Cape would fight in this war, the Mashpee Wampanoag, as well as the other tribes on Cape Cod and the islands of Martha’s Vineyard 5and Nantucket did not formally send men into this war. The populations of these tribes had still not been able to fully recover from the diseases of 1616-1619. Nantucket tribes would eventually be exposed to more European disease and lose all of its original people save a handful. 1685 The construction of the Mashpee Wampanoag Meeting House is completed and erected at Bryant’s Neck on Santuit Pond. The meetinghouse was granted $500 per year for the ‘propagation of the gospel to the Indians’. The Mashpee Baptist Church still receives these funds annually to this day. 1685 Plymouth Court (Plimoth Bay Colony) confirms title of Mashpee to the Mashpees (aka Southsea Indians; a term applied to the tribe by Whites). The territory then comprising all of present day Mashpee as well as portions of Sandwich, all of present day village of Santuit, all of the present day village of Waquoit, as well as a portion of present day East Falmouth up to current day Child’s River. 1685 Plymouth Court (Plimouth Bay Colony) confirms the right of Mashpees to maintain an entailment on all the lands of Mashpee. The entailment restricts the sale or lease or transfer of any land or resource without the consent of the entire tribe. 1742 The State of Massachusetts passes an act that orders all remnants of historical tribes within the state to move to one of the four communities that still have functioning Indian governments; the communities of Mashpee, Aquinnah, Herring Pond, or Grafton; although Grafton was actually Nipmuc Nation. 1742 The Mashpee Wampanoag send a petition for help to the Commissioners of Boston requesting assistance with a myriad of grievances; being beaten by English when fishing or hunting their own Wampanoag territory,having the White neighbors lease out their lands without their permission, the English selling Wampanoag land to one another without the consent of the tribe, of ‘These English neighbors of ours being in our trees, wood, and marsh without our consent’.This document goes on to remind the Commissioners that Mashpee had been legally set aside for Wampanoag only as long as Wampanoag Indians lived. The petition further states: ‘Truly we think it is this way; that soon we poor Indians here in this Indian place of Mashpee soon shall have no place to live together with these poor children of ours’. The problems with the document were that it was written in Wôpanâôt8âôk and the Commissioners most assuredly did not speak the language. Even if there was a translator the Mashpees were asking the very same group of English oppressors to protect them from that oppression. 1763 The State of MA appoints two White overseers to conduct all business pertaining to the Mashpee Wampanoag on behalf of the tribe. The tribe is stripped of the right to negotiate the lease of any of its’ lands or have control over any of the natural resources thereon. The history of Native American Tribes is part of the North American Culture. It is still my belief that history helps understanding the trials and tribulations of all cultures. Knowing where someone has come from helps us understand where they might need to go next.